When Gil and I were looking for houses, our Realtor told us of a “trick” that some homeowners use to make their homes more appealing. The trick is to bake cookies before people come to look at the house or to have a pot of cider simmering on the stove while people visit. What do either of those have anything to do with selling a house? Both the cookies and the simmering cider make the house smell like “home.” It makes the house more appealing and comfortable…more like home. Though we’re not selling our house, creating that feeling of home and comfort for visitors (and for ourselves) is something I want to do. Walking into a house and smelling a familiar, cozy fragrance makes the whole house seem more inviting and cozy. 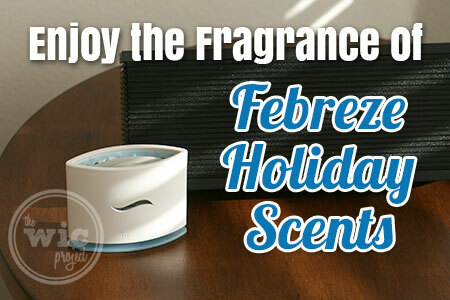 This season, Febreze has a new line of holiday fragrances that perfectly capture the scent of home. We received samples of the Cranberry Cider scent. As soon as I plugged in our Febreze NOTICEables Cranberry Cider Scented Oil, the wonderful fragrance of fresh cranberries with a hint of sweetness from the apples started wafting throughout the whole house. It reminds me of when I brew up apple cider, but with a berry twist from the cranberries. Don’t have an outlet in or near the room you’re trying to freshen up? 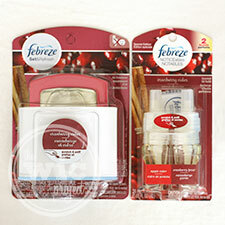 Febreze also has Set & Refresh Air Fresheners. These portable air fresheners allow you to add room fragrance wherever you need it. Just pop in the scent package into the holder and place it on a table or counter where you want the scent. I’d love to see some fun seasonal scent holders or this is the perfect way to brush up your crafting skills. A little bit of glue, paint, and glitter, and you can transform the holders into something unique for your home. With the Febreze Holiday Scents, it’s easy to bring the spirit of the holidays into your home with one if their seasonally inspired fragrances. In addition to Cranberry Cider, the Holiday Scent line includes Glistening Pine and Winter Frost. If you would like to bring the scent of the holidays into your home, you can find the new Febreze Holiday Scents at your local Walmart. One winner will receive a $10 Walmart Gift Card! I usually have something baking for the holidays and the added bonus is that it makes my house smell great. If I dont I usually boil some apple cores with cinnamon sticks! Baking makes our house smell great. Simmer a pot of water with orange peels, cloves, cinnamon. I bake a lot during the holidays and that helps make it smell good. I like using tart warmers and room sprays; anything pine or pumpkin scented this time of year is great. I like to burn holiday scented candles, like pine, sugar cookie or cinnamon. I use candles, potpourri, and sprays to make my home smell great during the holidays. I bake a lot and the house has a holiday smell! I burn candles– also do a little baking. I love scented candles in cinnamon type scents. First I make sure the house is clean but since we cook with a lot of spices, we crack a window and light a candle. We keep a candle warmer going. To make our house smell good, we make homemade cookies or bread. YUM!! I use Febreeze! I actually just bought my first Wood Diffuser from Febreeze and I absolutely LOVE it!